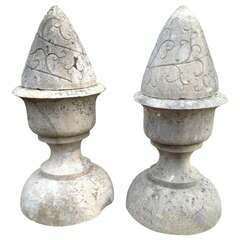 A pair of French hand carved white marble 'Pots à Feu' (fire urns) from the 19th century, with flame, foliage and swag motifs. Born in France during the dynamic 19th century, this pair of pots à feu finds its inspiration in both Baroque and Classical architectural traditions, the Château of Versailles being an excellent example of it. 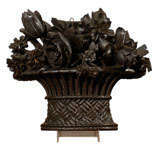 Each marble urn is adorned with a flame whose curvy lines suggest the movement created by the wind beautifully. The neck, adorned with a cavetto molding, is resting on a base carved with fluted motifs on three sides, accented with delicate foliage and a lovely floral swag. 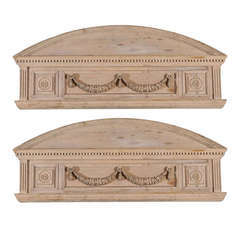 With its skilfully hand carved décor and nice patina, this pair of French pots à feu from the 19th century will be a wonderful decorative accent indoors or outdoors. 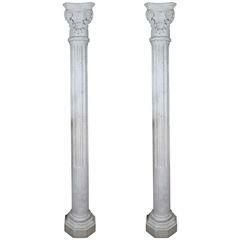 Pair of extraordinary early 19th century carved marble columns, beautifully proportioned and intricately carved. Each column is in four pieces - base, column, disc and capital.